KUALA LUMPUR: The launching of the second phase of the Mass Rapid Transit (MRT) Sungai Buloh-Kajang (SBK) line today might just change the lives of some 1.2 million people staying near the facility around Klang Valley. Prime Minister Datuk Seri Najib Razak said apart from saving time and cost, the world class infrastructure system also acts as a catalyst of change for the people. "A four-coached train will be able to give a comfortable ride to some 1,200 commuters. Imagine the space needed if each and every one of them continue to use their own vehicles to commute to work. “If the commuters were to leave their cars at home and take the train, imagine the empty space that we could have on the roads, and vehicle owners could also save time and cost,” he said after launching the new route at the Tun Razak Exchange Station here today. 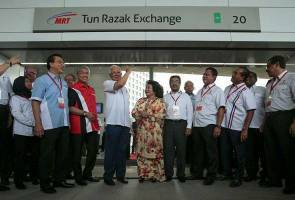 Apart from offering free rides along the MRT SBK line today, Najib also announced a 50 per cent discount on the fares for the MRT, LRT and Monorail services for all users from tomorrow to Aug 31 in conjunction with the independence anniversary of the country. The SBK line has 19 stations and will start operations at 4pm today. It will also have seven transit stations to existing rail services. This project also could have a positive effect on the environment because 160,000 vehicles in the Klang Valley were expected to be off the roads, thus reducing 752,000 tonnes of carbon dioxide emission annually.